Originally from Los Angeles, Craig arrived at Griffith and Thornburgh in 1977 after graduating UC Berkeley and law school at UCLA, and serving a stint as Assistant County Counsel in Ventura. Craig attributes his genuine enjoyment of practicing law to the trust that his clients place in him to solve challenging and important issues. 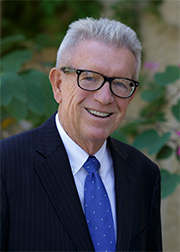 Outside of legal work, Craig is involved in various community leadership roles, currently serving as board president of the Santa Barbara Education Foundation, among other activities. He also occasionally finds time for fly fishing in Idaho where one of his adult children is a guide and photographer and for excursions to San Francisco and Seattle with his wife Tricia, where they enjoy long morning sightseeing runs and visiting their favorite food joints. Highest “AV” rating from Martindale-Hubbell, Inc. for over 20 years.